Saturday February 7th 1891 I got the work done and things fixed so Agnes could get dinner and Will took us girls to town We [or He?] had dinner at Hatties and then all went out to Fannys to spend the afternoon I knit all afternoon. Sunday February 8 1891 It was a stormy day. We sat around and talked the greater part of the day. I did not feel well toward evening and as Agnes did not come back Will & Lizzie did up the supper dishes. Monday February 9th 1891 I was busy with the work all the forenoon. Uncle Jacob came to dinner. I feel better today. After I got the dinner over I sat down and Uncle, Lizzie and I had a good visit I knit what spare time I had. Tuesday February 10 1891 We got the washing done and things fixed so Agnes could get the dinner. WIll took Lizzie over to Woolfs early and him and I went just as dinner was ready. 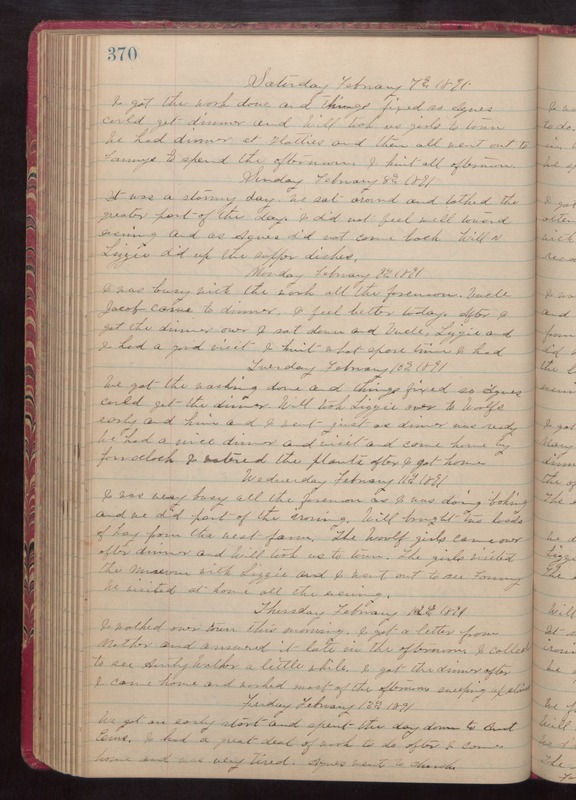 We had a nice dinner and visit and came home by four oclock I watered the plants after I got home Wednesday February 11th 1891 I was very busy all the forenoon as I was doing baking and we did part of the ironing. Will brought two loads of hay from the west farm. The Woolf girls came over after dinner and Will took us to town. The girls visited the Museum with Lizzie and I went out to see Fanny. We visited at home all the evening. Thursday February 12th 1891 I walked over town this morning. I got a letter from Mother and answered it late in the afternoon. I called to see Aunty Walker a little while. I got the dinner after I came home and worked most of the afternoon sweeping up [??]. Friday February 13th 1891 We got an early start and spent the day down to Aunt [Ems?]. I had a great deal of work to do after I came home and was very tired. Agnes went to church.